Love delicious, creamy yogurts? You may definitely like to try preparing your own at your home. It is fairly and you can easily control the flavors and ingredients. You just need is a yogurt starter and milk. You can buy dried starters in packets or you can simply use a store-bought plain yogurt as starter with active cultures. You may need to mix the cold milk and starter according to some instructions. While some suggest boiling milk first to high temperature and to let it cool to ferment its temperature before you add yogurt and let it to ferment. Be sure to follow manufacturer’s instructions given on the starter for your machine. If you are making homemade yogurt, you should make plain yogurt and add in flavors, sweeteners, fruits, chocolate or anything you like after fermenting it. You can make the thick Greek yogurt by straining yogurt with fine-mesh strainer or with coffee filter or cheesecloth to remove some whey. You can make yogurt cheese if you keep straining, which is spreadable and thick like cream cheese. What is The Best Yogurt Maker? – When buying yogurt maker, figure out whether you like to make yogurt in jars or in a large batch. If you want so strain yogurt, make it in large batches. For ready-to-eat servings, you can make it in separate jars. After deciding your style, you can choose from these yogurt makers. 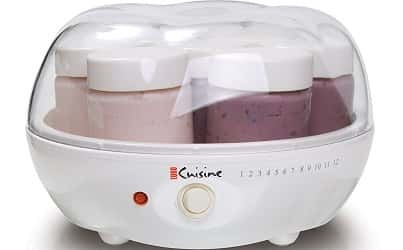 Euro Cuisine YM80 Yogurt maker is designed to make fresh yogurt at home and you can add flavor of your choice without any preparation and stress. It takes around 6 to 10 hours to prepare yogurt. It has 6 Oz glass jars with caps included in the yogurt maker so you can easily make different flavored yogurts in each. It has timer to indicate when yogurt is ready. It also has on/off switch and light indicator. If you want to prepare firmer yogurt without having to boil, simply add 10 tbsp of powdered milk to pasteurized milk in room temperature before you pour it in glass jars. Yogourmet 104 Electric Yogurt maker helps you to save money on commercial yogurt cheese, bottled yogurts and cultured milks. You can enjoy creamy, rich yogurt by making your own at home. You can prepare natural yogurt with different health benefits. You can control the flavor and ingredients. So, you can have peace of mind about what you are eating. Whether you love to have yogurt as an alternative to sour cream on baked potatoes, with granola in breakfast, as an on-the-go snack, or as ingredient in your baked goodies, this food is literally versatile and so is Yogourmet Electric Yogurt maker. Euro Cuisine proudly introduces the world-class GY50 Greek Yogurt Maker. Euro Cuisine is the European leader in the US market offers best products to American consumers. Now it introduces GY50 Greek Yogurt maker which prepares your dishes easily and quickly. It is a great BPA-free strainer kit which turns around 2-qts of Euro Cuisine homemade yogurt or you can store store-bought yogurt into creamy, thick Greek yogurt in few hours in your fridge. Enjoy healthy spreads and dips, low-calorie salad toppings, Tzatziki or sweet berry desserts with healthy homemade yogurts prepared by this machine. 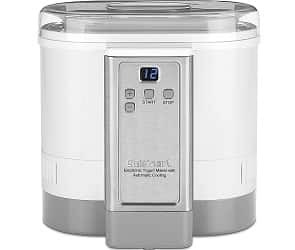 Cuisinart CYM 100 electronic yogurt maker is designed well to turn your soymilk and milk into healthy yogurt quickly and automatically. It is great for yogurt lovers to create different flavors and it has 1-1/2 liter batch to make delicious snacks and meals for days. It is also easy to operate. Unit turns automatically into cooling mode once time for processing is over. It is a perfect staple for modern health-conscious foodies who want to eat healthy. Yogurt contains probiotics along with calcium and protein that are needed for healthy digestion. When making yogurt at home, it literally takes the guesswork out. 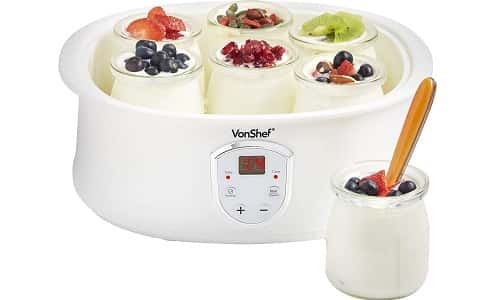 Make healthy and nutritious yogurt at home with this automatic digital yogurt maker from VonShef, which comes with seven 6.8 Oz yogurt jars and LCD display. Make the dreamy, creamy yogurts with few simple steps. Add culture or yogurt to pre-heated milk and add up your creativity by experimenting with ingredients and flavors. Fill yogurt with your loved dried fruits or get naughty with choco chips. Experiment with varied levels of thickness also. It also ferments and cools down ingredients to prepare 100% healthy and natural yogurt with no preservatives, colorings and artificial flavors. 100% healthy and natural yogurt created at your home with different flavors and ingredients. Say ‘goodbye’ to store-bought yogurt and make your own at home instead, by using this 32-oz stainless steel yogurt maker from Proctor Silex. You can have absolute control over what you add in your favorite yogurt recipe, whether you want low-sugar or non-dairy options. You can even replace syrups with fresh fruits. 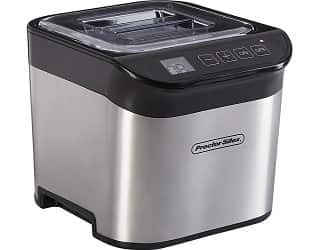 Proctor Silex yogurt maker is your best stable to prepare your own yogurt without using any other appliance. 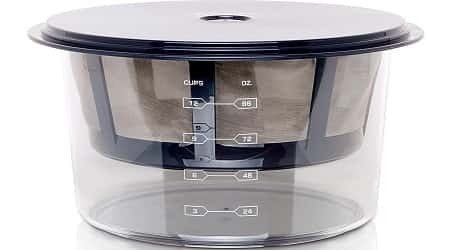 You would have to add culture at very low temperature in oven without yogurt maker and it takes several hours. 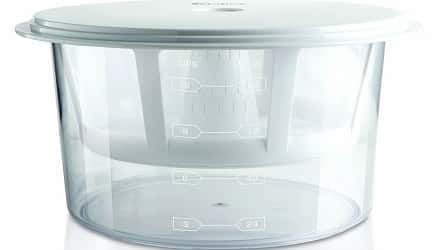 With Proctor Silex yogurt maker, you can save energy and time and leave your oven free for preparing other meals. 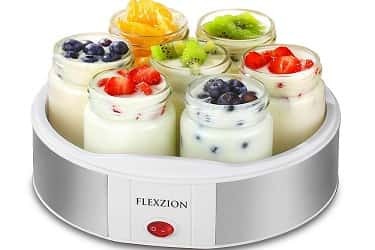 This automatic yogurt maker from Flexion has made it very simple and easy to make yogurt at home. You just need to add fresh ingredients and fruits and you will be amazed with how easy and simply you get your homemade yogurt ready. You can test up to 7 flavors in one batch and you will definitely get some exciting flavors. From Greek yogurts to fruity flavored ones, the choices are endless. Create your favorite GAPS and SCD diet friendly, Additive and Preservative Free, and probiotic-loaded yogurt in natural and simple way with Luvele Pure Plus yogurt maker. 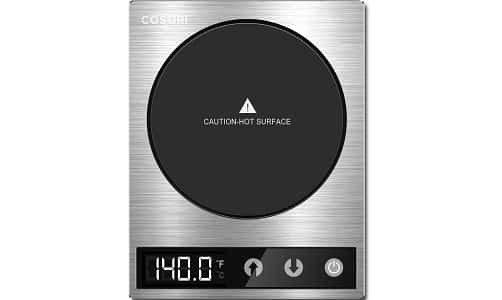 It has 24-hr digital timer to create your favorite yogurt and 3 temperature settings to set the yogurt to 36, 38 and 40 deg. C, ideal temperature to grow good bacteria and flourish active cultures. Do you love healthy, creamy Greek yogurt at home? You should definitely invest in Dash DGY001WBU-C Greek yogurt maker. It adds all of the probiotics to your favorite Greek yogurt without having to add flavorings or artificial colorings. Simply use any kind of milk and some store-bought yogurt to start. It also includes a complete recipe book with quick-start dial for quick reference. You can also access other recipes with ease. You can make healthy gourmet delicacies and make custom flavors. Make your favorite treats in easy and instant way with Euro Cuisine Greek Yogurt maker that comes with stainless steel strainer, which turns around 2-quart homemade or commercial yogurt into creamy, thick Greek yogurt in hours in your fridge. No need to crank or spin yogurt. Capacity of the Yogurt Maker: The most significant factor in choosing the prefect yogurt maker for you and your family is the volume of yogurt which the yogurt maker can make. If you have a large family, you will definitely want a maker that will have a higher capacity. Similarly, if you are someone who requires yogurt on a daily basis, you will also need a yogurt maker that has a higher capacity. Types and Size of the Container: Another important factor that you need to consider at the time of purchasing the yogurt maker is the various types and size of the maker in general. If you are looking for a high capacity of yogurt maker, then the container which you will get along with that particular yogurt maker will mostly be made out of plastic. 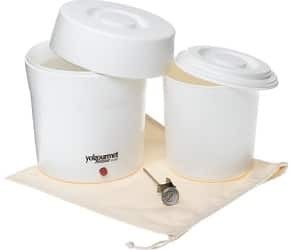 If, on the other hand, you are looking for a smaller yogurt maker, you will get something that might not have a lid as you would be looking for. 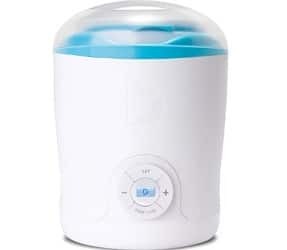 Hence, the size and the type of container should be a very important consideration at the time when you go for the purchase of a yogurt maker. Presence of Controls: A factor that most of us fail to consider at the time of purchasing a yogurt maker is the presence of different types of controls. When you are actually fermenting the yogurt, the proportion of ingredients that you would want to use in the container is something that you should be really careful of. The quality of thermostat and the presence of effective controls is something that is really important when it comes to a yogurt maker. Chiller: Most of us like to have yogurt that is really chill. Hence, one of the additional features that you shall be looking for is the automatic chiller option in your yogurt maker. There are a few devices that will directly go from fermenting to the chilling mode. 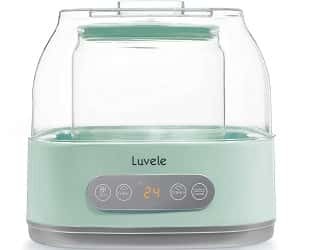 This type of yogurt makers will be really convenient for you because there is no requirement of you having to chill the yogurt time and again. You will be always able to use the cool yogurt as and when you require the same. Automatic Shut Off: In most of the cases, we do not understand whether or not the yogurt has been made. In such cases, the feature of automatic shut off is really helpful and it will be of great convenience to you as well. This feature will be helpful for you particularly if you are someone who is used to making big batches of yogurt at one go. It is usually very difficult to keep track of time when you are always on a go. Hence, the option of automatic shut off is a really convenient option for you for sure. Price: It is extremely important that whenever you spend your money on something, you get the full value of the money you spend on the same. There are many different brands of the yogurt maker that are available in the market. You need to be careful as to what you should spend and what not. Just buy the one which has all the basic features that you require and then select the one which is the most affordable one. Wash the Blades After Every Use: If you want to use the yogurt maker again and again without too much of an effort, you should make it a point to wash the blades of the device after each and every use. Otherwise, unwanted stuff will get accumulated and you will face difficulties. Avoid the use of Dishwasher: Avoid the use of dishwasher as the blades and the different component parts of the yogurt maker may get affected because of it. Use a Mild Soap and a Scrubber: A mild soap as well as a scrubber should be used for the purpose of cleaning your yogurt maker. Thus, I hope that the above points has been helpful and you shall consider the above factors while purchasing a yogurt maker. The yogurt makers listed above are designed to make your life easier by preparing yogurt at home. We hope this post has cleared out your doubts when buying yogurt makers. You can make yogurt easily and comfortably with these yogurt makers.